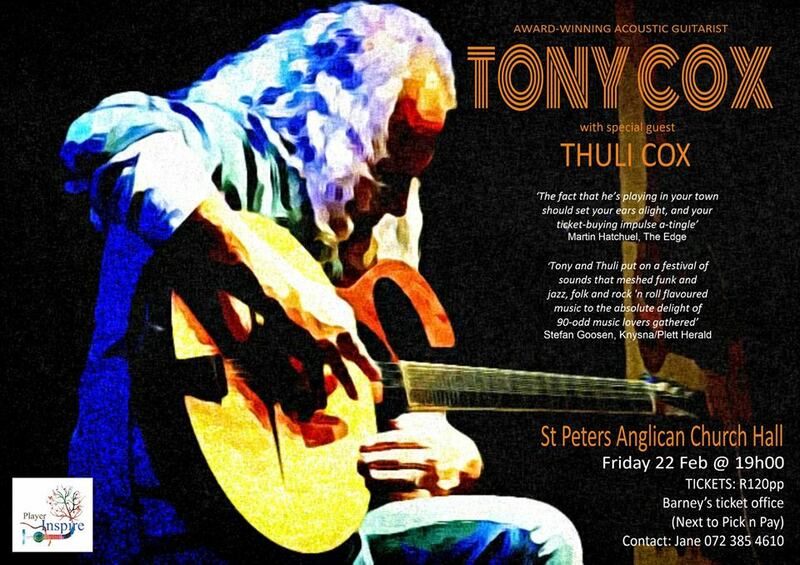 Tony and Thuli Cox's recent series of sold-out concerts, December Nights in Sedgefield was such a roaring success that they have been asked to bring their show to Plett. The show is a retrospective of one of the most influential South African acoustic guitarists of our time. Expect to be swept along on a journey of great skill and musicianship with music that will squeeze your heart and drop your jaw, all delivered with an infectious throw-away humour that will have your sides hurting. Cox is a multiple award-winning guitarist who has travelled the world and performed on it's finest stages. His performances across SA and beyond its borders are stuff of legend. Cox's golden voiced daughter Thuli, is making her first forays into live performance. She hopes to study for her degree in music one day and although only 14 years old is already sinking her teeth into some great old jazz standards. Thuli will be supporting her dad with a set of jazz and pop covers.